Children love learning their letters to their name. 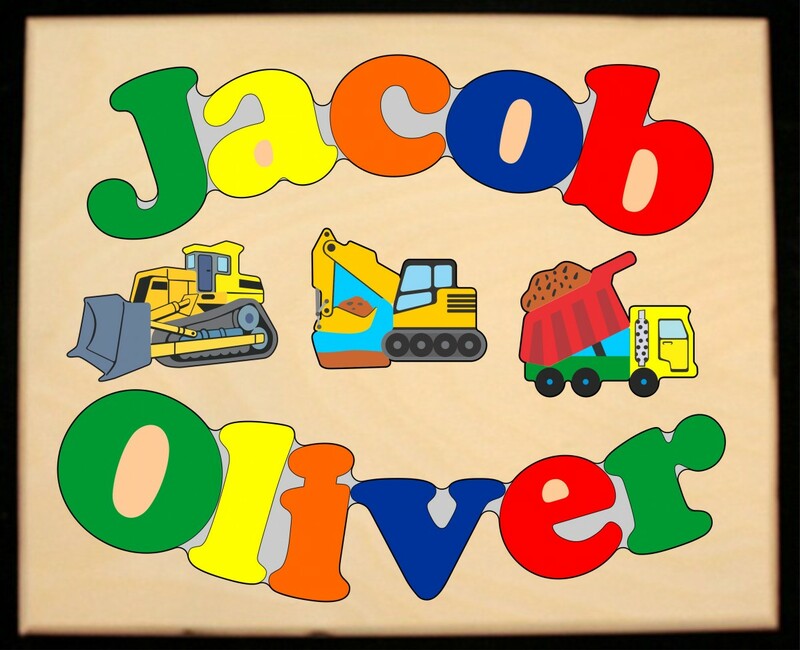 An educational toy puzzle that teaches children the spelling of their name just by playing with the puzzle pieces. 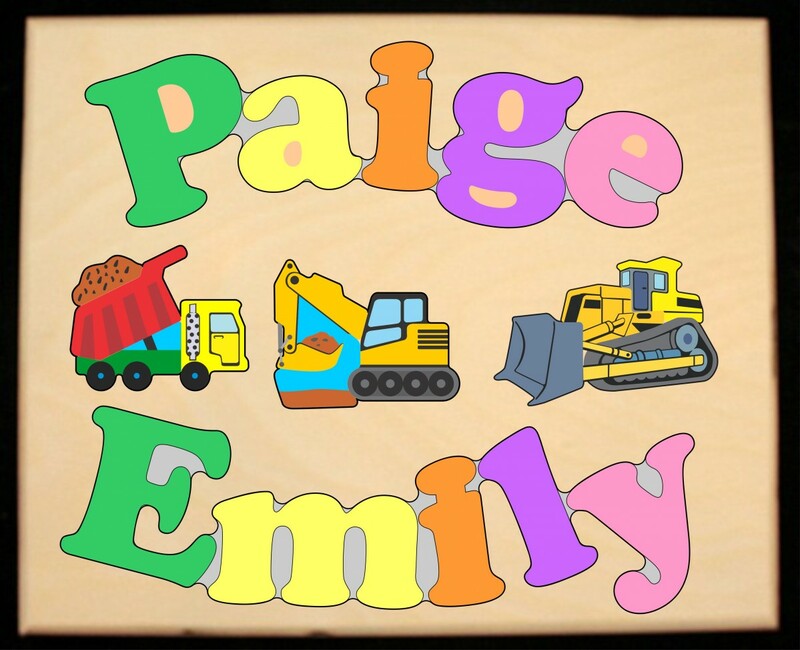 Also all of the colorful graphics (Bulldozer, Dump Truck and Excavator Graphics) also are puzzle pieces. 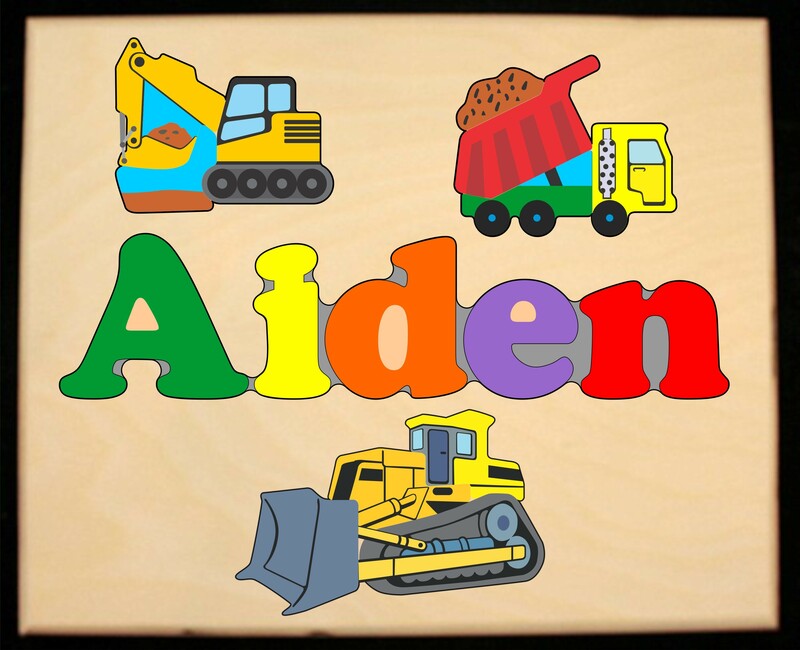 Our 1/2 inch thick wooden puzzle pieces are sized just right for a child's hands and our paints have been 3rd Party Tested and found safe for children to play with. The gray area in the image is the cut away exposing the underneath surface. 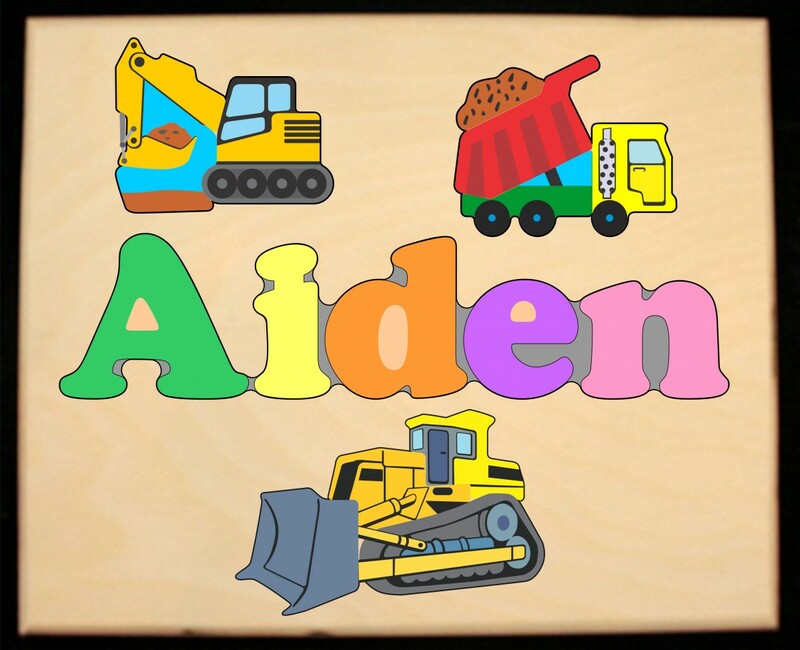 Names with 2-5 letters long go straight across the puzzle board as shown with the name AIDEN puzzle. Names that are 6-7 letters long, slants down from left to right as shown with the name MICHAEL puzzle. 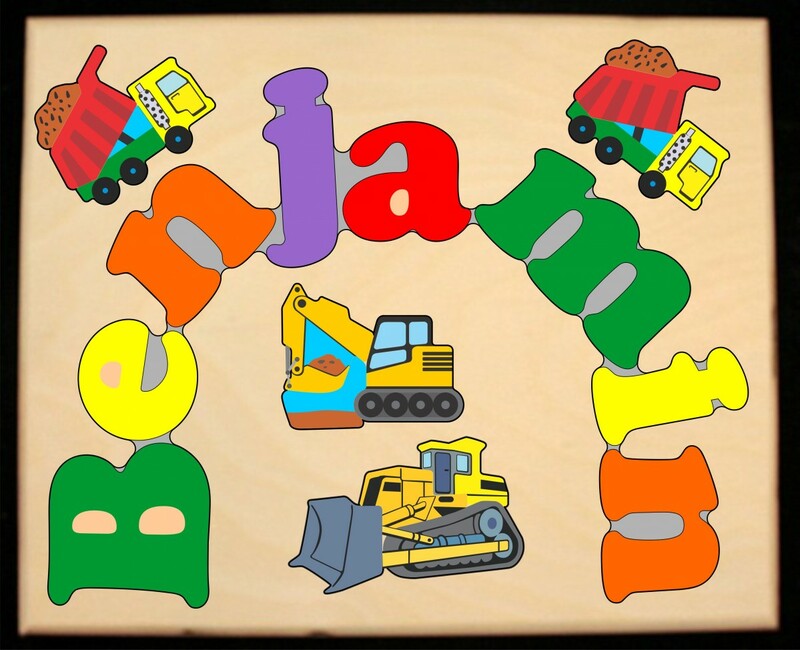 Names that are 8-11 letters long, the name will wrap around in a semi-circle as shown with the name BENJAMIN puzzle. With 2 Names on one puzzle, each name can not be longer than 6 letters long. 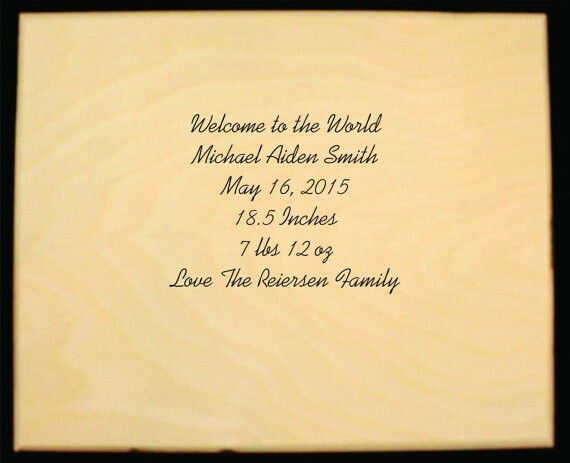 Each name will arch on the top and bottom as shown with the sample 2 name puzzles. View example images on the left before making your selection. Most orders are SHIPPED within 2 to 4 weeks! IT'S WORTH THE WAIT!!! Puzzle Size: 9" X 11" with 1/2" thick wooden puzzle pieces. 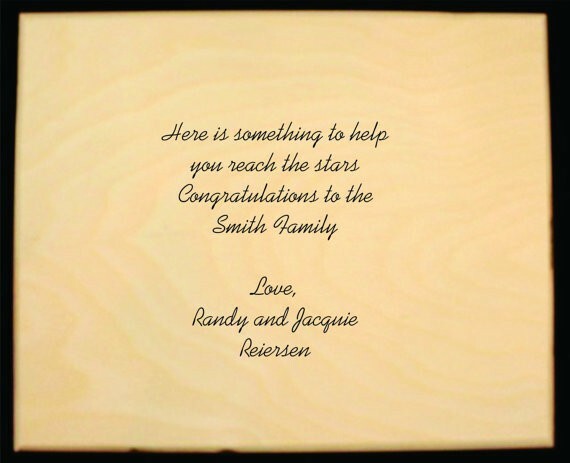 NOTE: This puzzle can also be purchased in our PUZZLE STOOL!!! 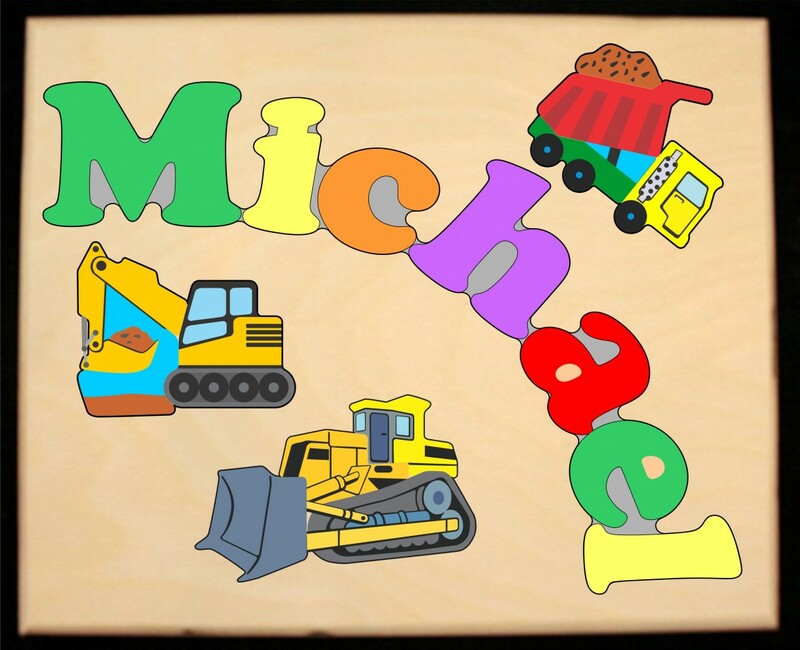 Every child's favorite outside sandbox toy, is the Construction Equipment! You can easily make this puzzle their favorite inside toy. 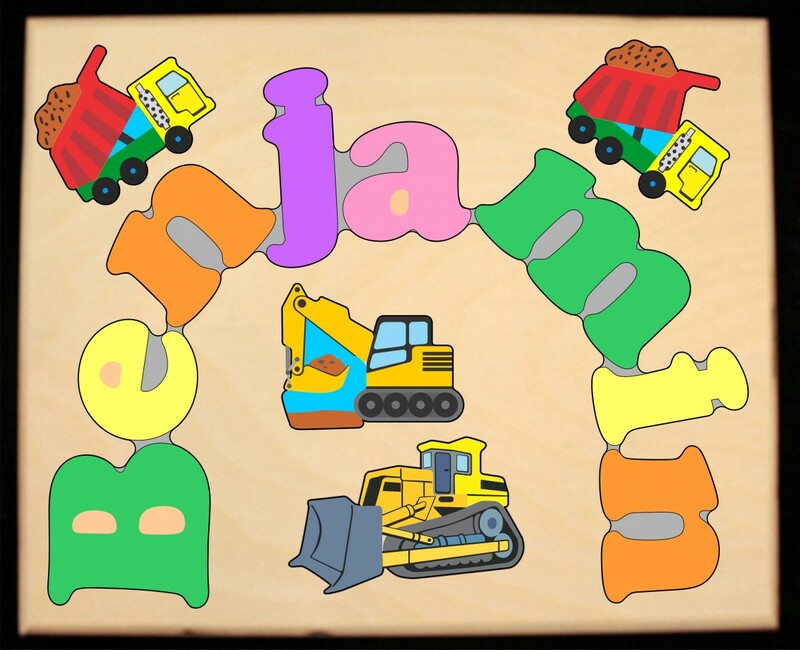 Children will love this construction backhoe, bulldozer and dump truck toy name puzzle. They learn shapes, colors and their name. Our 1/2 inch puzzle pieces are sized just right for a child's hands and all our paints have been 3rd party tested and found safe for children to play with. Shipped 2 to 4 weeks. HOWEVER, if you have a SPECIFIED DATE you need your order delivered by, let us know. We will make every effort to make sure it's there on time.